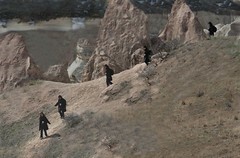 A series of photos from Cappadocia, Turkey that led to a nice unplanned photo montage. The most amazing part of this image, is that less than 30% is real (see the original photo to compare), the rest was fabricated in photoshop, by completely untrained me, from the grass to most of the rocks to the snowy background. The first time I ever created reality in a photo. Nifty and a bit scary how easy it was. SLuXX8 The best blog you have! 2XZ9tC actually, that's brilliant. Thank you. I'm going to pass that on to a couple of people.